Currently we have 2 floor samples on display at the Allan Knight showroom in Dallas, Texas. We are interested in finding good homes for both of them. The first piece is a Florence Buffet which measures 86-3/8" long x 19" deep x 35-3/4" high. 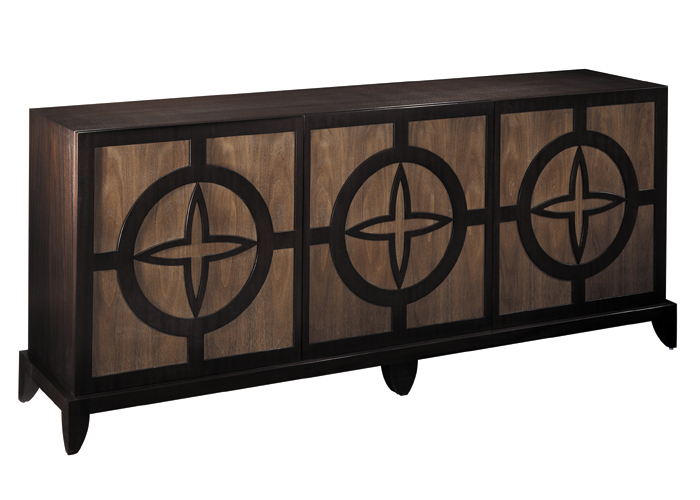 The cabinet exterior is finished in a combination of Tobacco Mahogany and Cerused Natural Walnut satin finish. There are 3 touch latch doors crafted of Tobacco Mahogany with recessed insets of Cerused Natural Walnut. Three natural maple compartments are located behind each door, with 1 adjustable shelf set into each compartment. There is also 1 lined and 1 lined/divided drawer located inside. 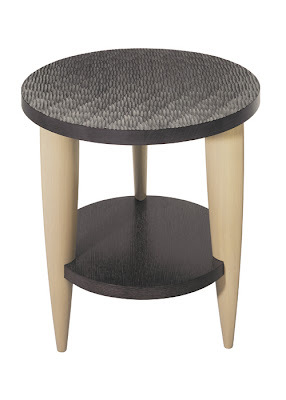 The Alina Table measures 30" dia. x 30" high and has a Dark Adobe Oak Top with beavertooth textured finish, set on 3 Cerused Limed Oak legs. The lower level is a non-textured Dark Adobe Oak fixes shelf. Please contact David for more information as well as available discounts.